On Tuesday I shared 5 Sure-Fire Ways For Marketing to Frustrate Sales. I’ve received several emails that show the post really struck a chord. I like what my friend and associate at HubSpot said in his comment on the post. At the end of the day, it’s all about “Smarketing.” In a Zero Moment of Truth world salespeople and marketers are in the game together. Any fracture will have damaging consequences. As promised, today I give equal credit (or blame) to the sales side. In 25 years selling and working with businesses on growth, I’ve witnessed a number of ways that salespeople frustrate marketers. Chief among these areas is simply the failure to think about the role that marketing plays in finding, selling and delighting customers. In my post Tuesday I shared that the biggest way marketers frustrate salespeople is by passing on leads that are not qualified. Equal to that problem are salespeople who think that the only good lead is the one that is ready to sign a contract. Solution: Create a clear set of criteria that determines what makes a lead “sales qualified,” and document how salespeople should manage those leads in a sales and marketing service level agreement. Salespeople are like many top performers. They’ve developed their routines. They’ve learned what works for them and what doesn’t, and they can be quite superstitious (don’t bring me the wrong pen for a closing meeting). However, salespeople can also be very brittle and stubborn. Markets are shifting, and buyers have totally transformed the way they gather information, make decisions and buy. Salespeople must be willing to adapt and try new things, or risk extinction. Marketers are responsible for trying new things. A core part of an effective marketer’s job is to always be testing tactics and ideas. This means that salespeople must be open to trying new things, even those things that will fail. Solution: Open up and realize that all great results started off as something unexpected. Be willing to try new things before you decide if they will work or not. “Uhm, I don’t think this will work; none of my customers would go for that.” That statement, or something similar, is voiced ad nauseam when marketing ideas are brought before sales teams. Look, I get it. Salespeople are in the business of creating a feeling of certainty in a world of ambiguity. “They may be wrong, but they’re never in doubt,” has been used to describe many great salespeople. But, you’ve got to know when to turn it on or turn it off. Solution: Use data to support your opinions. Keep track of your wins and losses and do debriefs to highlight those things that work and don’t work. Ask to see your marketing team’s key performance indicators so that you can use facts and data to discuss ideas, not knee jerk opinions. I took marketers to task in my previous post about trinkets, trash and balloons. Now it’s the sales team’s turn. The fastest way to frustrate a marketer is to ignore the sales tools that have been created or to change every sales presentation that was created. Here again, I understand what’s going on. Salespeople know more than marketers (sarcasm implied) and they need to change everything to make it just a bit better and more effective (yes, more sarcasm). Seriously, I do understand that marketers often do create material that is irrelevant or (yes) crap. BUT, WHO’S FAULT IS THAT?! Have you given them clear feedback about what’s happening in the field on a day-to-day basis? Have you shared the objections you’re getting or the messaging that is working (or not working)? The vast majority of marketers that I’ve worked with desperately want feedback from the sales team, they just can’t get it. The result is they create content and tools that don’t work. Solution: Create a regular routine where the sales and marketing teams share what they’re seeing and how they can work together better. The strangest observation I’ve made watching and working with sales and marketing teams is that for a group of people who work so closely, they know and understand very little about each other. Marketers are notorious for not understanding what salespeople really have to do. Yet, salespeople are just as bad in understanding a marketer’s role. Worse yet, they give little to no credit to the marketing team for their role in creating revenue. This can reasonably make marketers resentful. No one wants to do work and not be appreciated for it, and when salespeople take individual credit for what today is totally a team effort, it sows the seed of discontent. 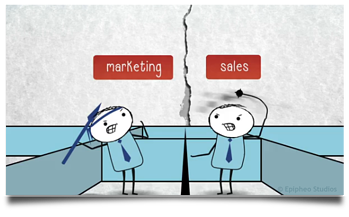 Solution: Here again a clear service level agreement between marketing and sales works to maintain alignment and allow each team the glory (or blame) they deserve.